In celebration of one of the most momentous occasions with the Royal Wedding taking place today (19th May 2018) between H.R.H. Prince Henry of Wales to Meghan Markle. Royal Crown Derby are pleased to launch The 2018 Royal Wedding Commemorative Collection comprising of four breath-taking pieces including an Old Imari Solid Gold Band Melbourne Tray in a limited edition size of 500 only, an Octagonal Plate with a limited edition of 1,500, a limited edition of 1,000 Loving Cup and a sweet Heart Tray. 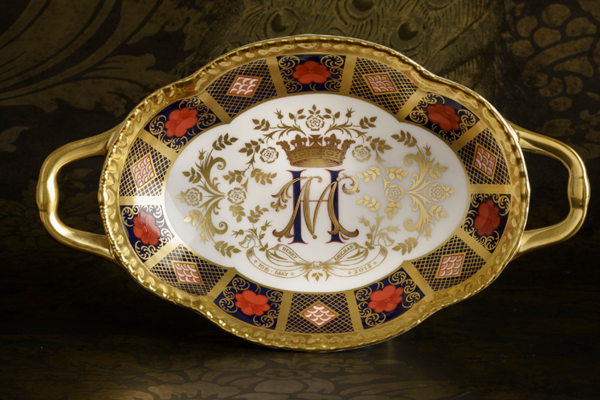 Adorned in the archival classic Old Imari pattern, the Solid Gold Band Melbourne Tray design creates a perfect border for the ornate centrepiece motif, which denotes the initials of the Royal couple, centred with Harry’s initial in cobalt blue and Meghan’s initial ornately intertwined in gold with a gold coronet above the initials to represent the Prince with a gold ribbon inscription noting the couple’s names and wedding date. 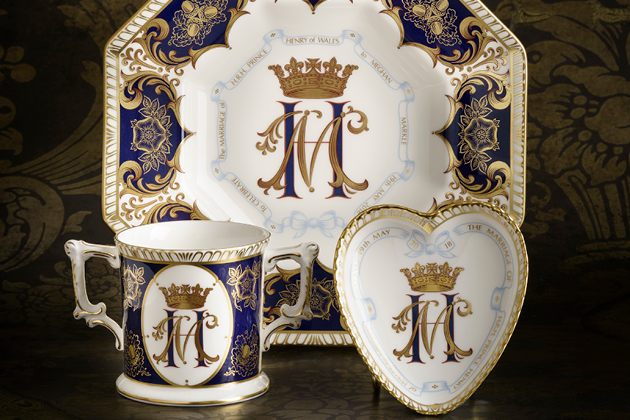 In line with previous Royal Wedding Commemoratives, the Octagonal Plate, Loving Cup and Heart Tray depict a design created with the inspiration based around the William and Catherine design, including a rich cobalt blue background to enhance the overlaid 22 carat gold with a scrolled inscription reading, ‘To celebrate the marriage of H.R.H. Prince Harry of Wales to Meghan Markle 19th May 2018’ on the Plate and Heart Tray in a flow of pale blue ribbon designed around a central initial motif and a smaller inscription designed on the Loving Cup. The intricately detailed design showcases gold acorns symbolic of longevity and the House of Windsor, alongside England’s emblematic Tudor rose, together with an ornamental scroll detail throughout the design which has been used across the Royal Wedding Commemorative Collection. Each piece is finished in hand-applied 22 carat gold with all items having a special gold backstamp, and supplied individually in a gift box.